Adrian: [Seeing Adrian for the first time in Russia] I couldn't stay away anymore. I missed you. Adrian: I'm with you no matter what. Adrian: [Nods] No matter what. Q: What age is Rocky in this film? 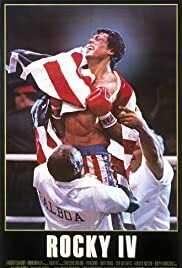 Q: If Apollo Creed was as good a boxer as he was made out to be in the previous films, how did Drago beat him so easily? One of my favorite movies ever !! As a kid I used to watch this movie endlessly with my friends and brothers. It always had an aspect that I found so powerful; having no pain. No matter what comes our way, you fight your way through the pain in life till the end. Apollo dies and Rocky has to fight for his vengeance. It was always so heartlfelt to me that Rocky fought for those he loved. He examplified the importance of having no pain and fighting for his true desire and love. I'll be the first to admit that this movie is pure fantasy but it was powerful to me. I also connected with Rocky's character and knew that he had flaws but yet he just never gave up and kept on punching. Growing up, I picked up on cheesy parts but it still delivered the same chills and motivation as I got older. This movie has its faults but it's so meaningful and the action is near perfect. Literally the biggest problem to me now is Rocky barely blocks at all! If only he did, along with some tweaking, this movie would earn a well deserved 10/10. I wish they perfected the realistic side to it to make it even better and I say that with love. All in all, seriously a fantastic ride alongside one of my favorite actors.